Balboa – Fast and Fancy Footwork – Swing or Nothing! Balboa can refer to a family of swing dances that developed in Southern California around the 1920s and 30s, as well as to a specific dance of that era that was the original Balboa (sometimes called Pure-Bal). Like its dance contemporary the Lindy Hop, Balboa also had roots in the Charleston. 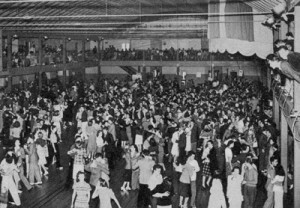 However, whereas Lindy Hop originated in the Harlem Ballrooms of New York and spread nationally, Balboa was primarily a Southern California phenomenon. In contrast to Lindy Hop’s signature breakaway or swingout movement, Balboa is primarily danced in a close embrace, and led with a full body connection. It was designed to take up a small space on a crowded dance floor, and its basic step chains two-step movements, while shuffling feet on the floor. Modern swing dancers distinguish between original Balboa or Pure-Bal and Bal-Swing. In Pure-Bal, partners dance exclusively in closed position, torsos touching throughout the dance, and embellishing almost entirely with footwork and rhythms. Bal-Swing allows for more space between partners, leaving room for turns and more dynamic movement in the dance. Balboa was danced as early as 1915, was most popular in the 1930s and 40s, and was named for the Balboa Peninsula in Newport Beach, California, where it originated. Because of the small size and elegant efficiency of Balboa’s basic step, the dance is both well-suited to dancing on a crowded floor and to dancing to high tempos. Indeed, Balboa dancers commonly dance to music that is upwards of 300 beats per minute – well beyond the range at which most Lindy Hoppers comfortably dance. Modern Balboa dancers often seek out gypsy and traditional dixieland jazz bands to which to dance, precisely because these music forms often push the higher tempos. Another great reason to learn Balboa is its emphasis on intricate rhythmic embellishments and footwork precision, aspects which are sometimes sacrificed in Lindy Hop where macroscopic turns and movements dominate the aesthetic. Playing with footwork variations and developing precision in your Balboa can translate to cleaner and more interesting footwork in your Lindy Hop too. In summary, it’s great for Lindy Hoppers to know at least bit of Balboa because it’s useful when the dance floor is crowded or when the music is too fast to Lindy Hop comfortably, and because it can open up possibilities for interesting footwork variations and developing greater footwork precision. Randy Maestretti & Kara Brit as well as Carla Heiney are champion-level Balboa instructors based in the South Bay who offer private lessons and often teach at local and national workshops. The San Francisco Balboa Swing Dance Festival is an annual event workshop and competition in December which features internationally renowned instructors. On August 20, 2011, you can also learn some Balboa at the first ever California Swingin’ Workshop @ Cheryl Burke Dance Studio, Mountain View, CA.